It's just days until the start of Oracle's OpenWorld conference, an already massive affair that will be even bigger this year given the company's recent acquisitions and forays into new product areas. OpenWorld will also serve as an introduction to Oracle's new executive structure, which many observers have concluded doesn't amount to much of a change at all. Last week, Oracle CEO Larry Ellison became executive chairman and CTO of the company, with Mark Hurd and Safra Catz named co-CEOs. All three will continue doing much the same jobs they had been doing, with Ellison overseeing engineering, Hurd handling sales and Catz running operations. Nonetheless, the initial groundwork of a succession plan for Ellison, who recently turned 70, has been laid. Of more interest will be the messages Oracle delivers -- or doesn't deliver -- to customers and partners through the show's major keynotes and sessions. Here's a look at what to expect during the event, which begins Sunday and continues through Thursday. Ellison may have shed his CEO title in favor of becoming executive chairman and CTO, but he's still planning to join Oracle's annual earnings conference calls and he'll make a pair of keynote appearances at OpenWorld, including opening the conference Sunday. The OpenWorld website is mum on what Ellison will talk about that evening, as well as during another talk Tuesday. 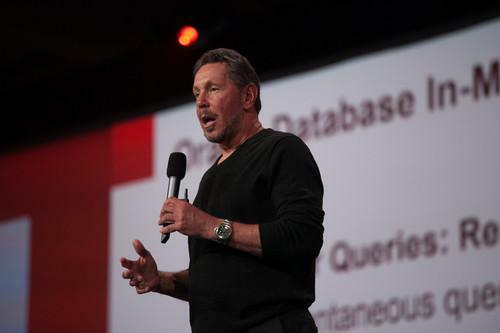 But the man himself gave at least one big clue during last week's earnings call, saying Oracle plans to launch its DBaaS (database as a service) at the event. Oracle's DBaaS has been discussed and available for some time, so it's not clear what if any new twists Ellison may introduce. At a minimum, he'll likely use OpenWorld as an opportunity to rev up the hype with his typical bombast, if his comments last week are an indication. "With the push of a button your existing application automatically becomes a multi-tenant application and it's moved to the Oracle Cloud," he said. "No reprogramming is required. Hundreds of thousands of customers and ISVs have been waiting for exactly this. Database is our largest software business and database will be our largest cloud service business." It remains to be seen how successful Oracle's DBaaS will end up being, but the way things are headed, there's certainly an opportunity, according to analyst Ray Wang, chairman and founder of Constellation Research. As companies move operations to the cloud and take advantage of big data analytics, "most of your data is going to be created outside the four walls of your enterprise," he said. "So you've got to be able to connect so quickly to external sources and stream this data." This is a role Oracle wants to play, Wang said. Hurd is scheduled to deliver a keynote Monday dubbed "The Business Value of the Cloud." More telling than that rather benign title, though, is the fact that no fewer than seven prominent CIOs from the likes of Procter & Gamble, General Electric and Intel will join Hurd to share their success stories using Oracle's cloud-related products and services. The message Oracle wants to send, and may succeed in sending, to its broader customer base is clear: If a group of the world's most prominent companies are willing to give a high-profile public endorsement of Oracle's cloud efforts, then all Oracle customers can benefit. Based on the keynote description, the group of CIOs will also discuss their use of Oracle's hardware-and-software appliances as well as its analytics software, which won't hurt either. The focus on cloud computing as a top-level message at OpenWorld continues Tuesday, when Chief Corporate Architect Edward Screven and Thomas Kurian, executive vice president of product development, deliver another keynote, "Cloud Services for the Modern Enterprise." That session will likely be a bit more technical than Hurd's presentation and should focus heavily on Oracle's growing family of SaaS (software-as-a-service) applications and its entry into the PaaS (platform-as-a-service) market. Expect particular emphasis on Oracle's customer experience software strategy, Wang said. Like rival vendors, Oracle has made acquisitions in order to build out a suite of software that spans from sales and support to marketing and social media analytics. "That's really the future of Oracle right now," Wang said. One of the hottest tech trends is the Internet of Things. Oracle's take on it will likely be highlighted Wednesday during a talk by its executive vice president of systems, John Fowler. Fowler's keynote is titled "The Real-Time Enterprise" and will describe how companies can use Oracle's panoply of hardware and software products to "achieve a continuous real-time view of customers, always-reconciled financials, deep instant analytics, and always-ready services," according to the OpenWorld website. Oracle hasn't made a lot of noise about where it stands in the IoT market -- the time seems ripe for it to do so during this year's show. Fowler could also announce new members of Oracle's "engineered systems" family, which was hatched back in 2008 with the launch of the Exadata database machine. However, Ellison may have already spilled news of that nature during his second speech Tuesday.